Happy Friday, color lovers! Remember that Cranberry kick I told you that I was on? Yep, I'm still on it. And seeing that it pairs so well with so many colors, I think it's safe to say that my love for this color is only growing. Last week I shared with you this Cranberry and Dusty Blue color palette. But this week? It's all about Cranberry and Mustard. Fit for Fall and oh-so pretty, these colors really did have me at hello. Those bridesmaid dresses look absolutely striking beneath those amazing fall leaves. And this rustic cake? Hello, perfection! I love the cranberries on top and the drizzly effect. And what could be more perfect than a signature drink made to coordinate with your color palette? It's a beautiful, festive look that has me really excited for Fall. So much so that I think it might be time to break out my Fall decor. Yep, it's decided. My mantle is crying out for gorgeous garlands and pumpkin spiced candles. Need a little more Fall inspiration? Well, then be sure to check out my full collection of Fall palettes! 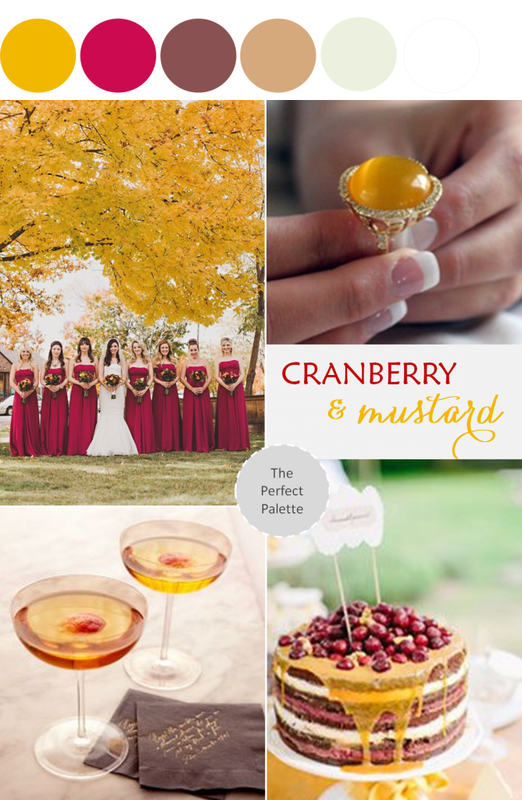 9 Comments " Color Story | Cranberry + Mustard "
So lovely! And that cake looks amazing. The cranberry and mustard, wow! Love how the mustard is brought in naturally with the leaves as well. I love those bridesmaid dresses! Gorgeous combo! Cranberry is definitely my favorite fall color. I could sure use one of those cocktails–cheers, and happy Friday! he he! Sounds pretty good about now! Hope you have a great weekend, Lena! Yes! Such a gorgeous color to have come from nature! Total perfection for a fall wedding!